Spinning Show & Tell: Not much to show! After last week's post, I took almost a whole week off from spinning (and knitting) so there's not much to show you today, other than some lovely things which I am trying out this week. 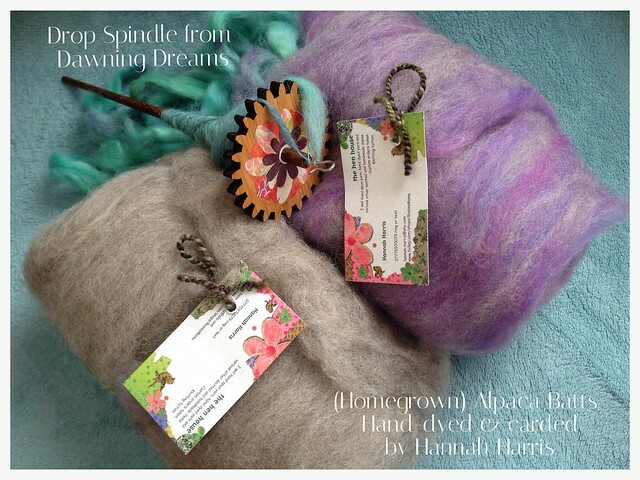 The first is a beautiful drop spindle from Dawning Dreams. I have had a little play with it so far and it's beautiful - it weighs 25g and has a lovely feeling to it, not to mention being very pretty! Secondly a super-soft parcel of alpaca batts arrived from Hannah of 'the hen house' - you may remember Hannah from this post. She is one of the people who inspired me to start knitting and spinning (her handspun Pogona is one of my most coveted knits) and is now producing fibre (and selling raw fleece) from her mum's alpacas, so I can't wait to give these a try. Hannah is currently working on custom orders, so her shop isn't stocked, but you can contact her for more information or if you would like some fibre to be custom dyed. Well that's it from me - short and sweet this week, but here's the linky to other spinning posts, and I'll be back with some knitting and a few different books tomorrow. Ooh, I've fallen down the rabbit hole! Now I am on the hunt for all thing fibre and fabulous :) I love your new spindle and I'm off to check out the links - the fibre is pretty. Gorgeous spindle! You've given me a case of the wants despite having just bought a new spindle! I hope you will be back to spinning and knitting soon (but not too soon - you are smart to make sure you're feeling better). That Spindle is gorgeous! I agree about Hannah being lovely - everyone go visit the Hen House! What a neat spindle. I hope to try park and spin this week. Love those batts! Can't wait to see how they spin up!